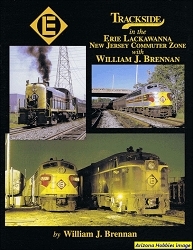 On April 1, 1976, the Central Railroad of New Jersey and Penn Central, co-owners and operators of the NY&LB, were absorbed along with other bankrupt northeastern roads into the Consolidated Rail Corporation. Conrail then began operating passenger service along its North Jersey Coast Line under contract for the New Jersey Department of Transportation. NJDOT had been funding replacement equipment for the states's commuter operations since the late 1960s. CNJ's shore trains had been re-equipped with new GP40Ps and coaches purchased from a variety of roads, some of which were Burlington Northern, Kansas City Southern and Rock island; however, by 1976, much of the former PC motive power and rolling stock covering the New York runs was suffering from years of deferred maintenance and required rebuilding or replacement. The pressing need for service improvement served as the catalyst for the equipment variety seen on the following pages. E8s were rebuilt by Illinois Central Gulf at Paducah, KY, by Conrail at Elizabethport and General Electric at North Bergen. In an effort to present a new image for the benefit of passengers, NJDOT's blue, silver and red scheme, which had debuted on the U34CH fleet operating on former Erie Lackawanna lines out of Hoboken Terminal, began appearing on North Jersey Coast Line power. Conrail provided its own E units and locomotives from its freight pool as required. Several E8s acquired from the Southern Railway added a splash of Southern green. Created in 1979, the colors of NJ Transit began appearing on locomotives in 1980. Further enhancing the equipment mix were Amtrak GG1s and E60CHs, which supplemented NJDOT's own GG1 fleet as needed. In addition to passenger train operations, Conrail had its core business of freight trains to run and several views of freight action are included. Major improvements to the railroad's infrastructure took place as well during this period. 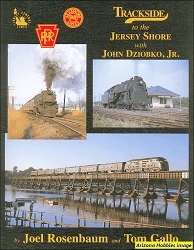 Examples of such projects which appear in this book were the rehabilitation of the Navesink River bridge and the extension of electrification from South Amboy to Matawan. 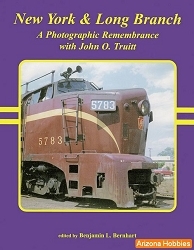 Although the book is intended to serve as a photographic remembrance of North Jersey Coast Line operations under Conrail. NJ Transit assumed operation of the railroad from Conrail effective January 1, 1983, several images taken after this date have been included as they portray trains whose consists remain relatively unchanged from the Conrail period. All in all, it was a fascinating period and provided the foundation for further enhancements resulting in the North Jersey Coast Line of today. Enjoy your ride through these pages. Outer Station Project, hardcover, 80 pages, 11 x 8.5 x .5 in., high quality 100 lb Sterling Gloss Paper, 83 full color images. Trackside to the Jersey Shore with John Dziobko, Jr.